The international tank competition Strong Europe Tank Challenge 2017 have come to an end in Germany; Ukrainian tankmen, who have taken part in the biathlon for the first time, took the fifth place. The tank biathlon took place at the training center of the 7th Army Training Command of the U.S. Armed Forces in Grafenwoehr (Germany) from May 7 to May 12. 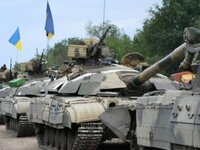 The purpose of the competition is to increase the technical and professional experience of tank units in the armies of Europe, the website of the Defense Ministry of Ukraine said on Saturday. In the tank biathlon of NATO, along with the tank divisions of the U.S., Germany, France, Poland and Austria, the Ukrainian tank platoon of the 14th separate mechanized brigade of the Land Forces of the Armed Forces under the command of Captain Roman Bahayev on the regular armament - modernized T- 64BB tanks took part. "As a result, the Strong Europe Tank Challenge 2017 championship was won by the tank platoon of the Austrian Armed Forces on the Leopard 2A4 tanks. Second place was taken by the German tankmen in the Leopard 2A6 tank corps. The American servicemen received "bronze" on the Abrams M1A2 SEP tanks. Ukrainian tankmen ranked fifth in rating by points, demonstrating one of the best results of shooting by a standard projectile from a tank," a message says. Commander of the U.S. Army in Europe Benjamin Hodges noted the high level of training of the Ukrainian military. "The Ukrainian soldiers are the only ones among the participants in the competition who have real combat experience against enemy tanks. Everyone considers their experience," he said, adding that the experience of the Ukrainian platoon that fought against Russian tanks is extremely useful for all participants of the competitions. The program of the competition included two main parts - combat firing by units in the offense and defense, as well as performing a variety of exercises: from regular small arms, fire support, driving vehicles, distance to targets, target recognition, tactical medicine and the evacuation of the wounded; the use of weapons of mass destruction by the enemy, the evacuation of a damaged tank, and others. The program of the championship also included checking the physical preparation of the participants, in particular, during the overcoming of the specialized obstacle course and sports relay race.